Three New York buildings have taken a step closer to global acclaim after winning the regional heat of The Outstanding Building of the Year (TOBY) competition hosted by the Building Owners & Managers Association. SL Green took home the Earth Award for its work at 1515 Broadway during the BOMA Mid Atlantic Conference awards last week. A CBRE management team collected the award for Renovated Building for 280 Park and Tishman Speyer won Corporate Facility for Hearst Tower. SL Green’s Michael Wildes with BOMA MAC Regional TOBY Chair Caroline Kruger (Boston Properties, Washington, DC). All three properties will now go on to compete against properties from around the world in the BOMA International competition, which will declare the winner at its global conference in Salt Lake City in June. The trio of New Yorkers are bidding to bring back a title that was last won by New York in 2015 when Monday Properties was crowed International TOBY winner for Historical Building for their work on 230 Park Avenue. The last “big win” was in 2008 when Related Companies won Operating Building over 1 MSF for its groundbreaking Time Warner Center at Columbus Circle in 2008. “The BOMA award was created in 1985 to salute excellence in the office building industry. Nearly 35 years later, it remains the single most prestigious and comprehensive distinction of its kind in commercial real estate, recognizing quality in office buildings and excellence in office building management,” said Tom Krol, Donnelly Mechanical vice president and the BOMA director who emceed the MAC round of the competition at the Kimpton Hotel Ventana Ballroom on Avenue of the Americas. Owners SL Green and Vornado spent $150 million repositioning 280 Park, a midcentury building comprised of two conjoined properties occupying the full block front between East 48th and East 49th streets. 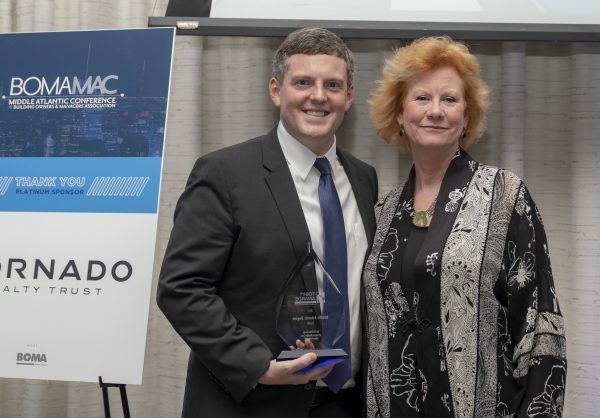 A CBRE team led by Charles Marr manages the property and he accepted the MAC award. His team oversaw a massive environmental upgrade of 280 Park and a complete redesign of the building’s infrastructure, including elevator cabs, bathrooms, thin line perimeter induction units, electrical distribution and security enhancements. 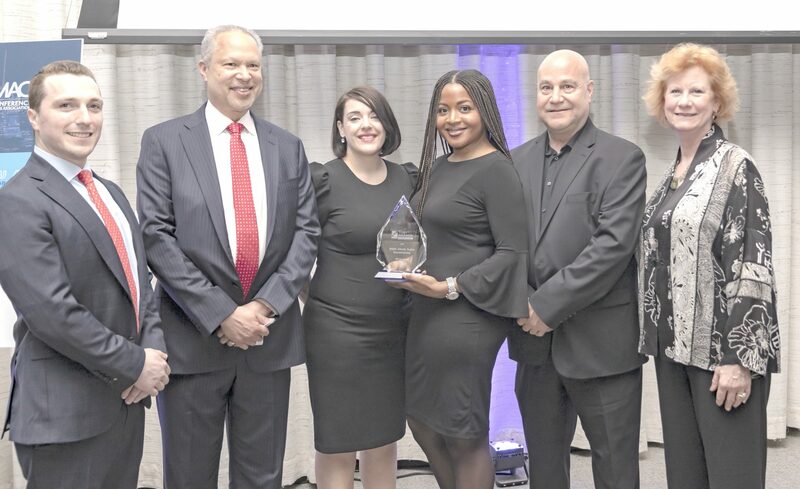 Adam Leibowitz (CBRE), Charles Marr (CBRE), Theresa Trespalacios (CBRE), Shannel Brown (CBRE), Marty DiMaso (CBRE) and BOMA MAC Regional TOBY Chair Caroline Kruger (Boston Properties, Washington, DC). 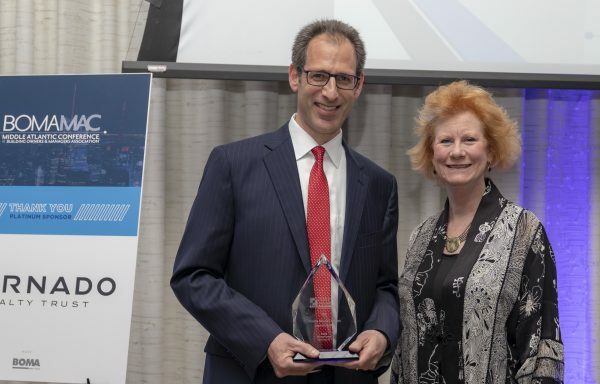 Six years after rising above 57th Street, Tishman Speyer’s Hearst Tower was recognized as Corporate Facility of the Year. New York’s first LEED Gold certified office building, the Norman Foster-design property has since achieved the Platinum designation. Lou Nowikas of Hearst and BOMA MAC Regional TOBY Chair Caroline Kruger (Boston Properties, Washington, DC). SL Green’s Michael Wildes accepted the Earth Award for 1515 Broadway where sustainability highlights include LEED accreditation and Energy Star, Wired and BOMA 360 accreditation. 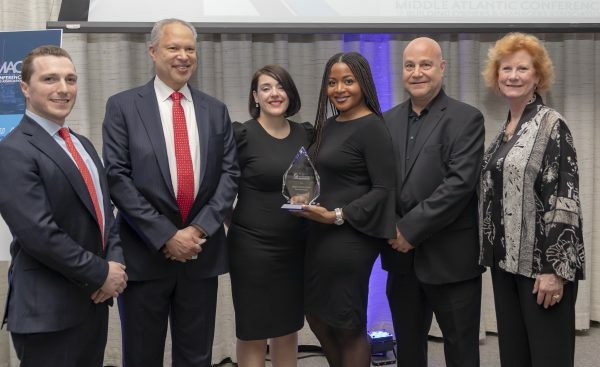 Piedmont Property’s 200 & 400 Bridgewater Crossing campus in New Jersey won the Mid Atlantic Grand Pinnacle for its management by Piedmont Office Management.